A few weeks ago, I mentioned that I was planning on painting our upstairs bathroom using a leftover can of paint from our master bedroom and today I am so excited to show you all how it turned out! As I mentioned before, when I get stressed I paint, and after I returned from the Women's March in DC I was itching to give our upstairs bathroom a little facelift. Previously, I had painted it mint, really just because I wanted it to be a happy place, but the problem was that the mint didn't really go with the tile. Listen, it was fine, but out of the rooms in out home this was the one that always bugged me. It doesn't help that this is the one room that is visible from our living room and because you see it every time you walk in or out of the home, I think I just noticed it more. You know that I truly believe that there is nothing that a can of paint can't fix, and in this case the transformation could not be more dramatic! Just take a look at the "after" photos! I ended up painting the ceiling and I think that was such a good call! Honestly, it wasn't intentional, it was more a case of a shaky hand getting too much paint on it, but I couldn't believe I hadn't thought to paint it prior. One would think putting such a dark color on the walls, and ceiling, and moldings would make the room feel smaller but it actually has the opposite effect, it makes it feel so much bigger! When the walls and the ceiling become one, you don't really feel how small the room actually is and this has me seriously thinking that I should always do this in tight spaces. 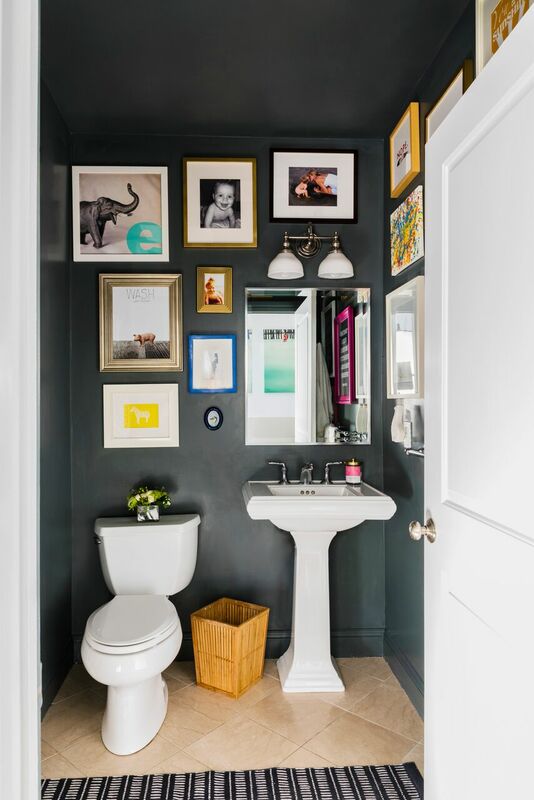 Mint bathroom photo by Sarah Winchester Studios (@sarah_w_studios on Instagram) all after photos by Sabrina Cole Quinn Photography (@sabrinacolequinn on Instagram).